Following Tim Lambesis' recent imprisonment, the remnants of AS I LAY DYING have weathered the bad press and ill public tidings suddenly dropped into their laps. The phrase grace under pressure is applicable to Phil Sgrosso, Nick Hipa, Jordan Mancino and Josh Gilbert as they've taken the backlash from the Lambesis sentencing upon their collective chins without adding fuel to the fire. Mancino, who is a reported partial owner to the rights of AS I LAY DYING with Lambesis, remains its lone official member. While AS I LAY DYING is officially on hiatus, the foursome has hooked up with OH, SLEEPER vocalist Shane Blay to form a new group, WOVENWAR. 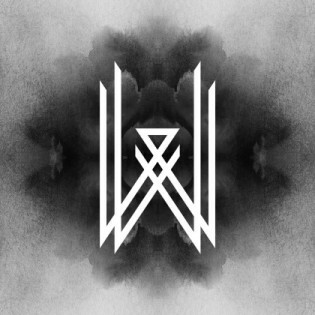 The popularity of AS I LAY DYING should attract the band's followers straight to WOVENWAR, which, upon their self-titled debut, sounds like a new and improved ensemble, albeit a pop-oriented one — caveat to those adverse. For all intents and purposes, this is AS I LAY DYING with a new singer amidst their ranks. Yet WOVENWAR strays mostly away from the former's metalcore modes and goes for a tighter, straightforward hard rock attack. "All Rise" and "Death to Rights" are a couple of poppin' melodic numbers and even though each bear predictable breakdown segments, they're both catchy as hell. Shane Blay is an appealing clean vocalist who rides the electric waves generated by his new band mates. Better, he supplies an extra guitar alongside Nick Hipa and Phil Sgrosso to kick up the tones. Together, they homogenize with tautened lines and superb solo blasts to open the album with encouraging jumpiness. "Tempest" thereafter changes gears with its checked-down tempos switched between medium and slow as Blay croons confidently with harmonious supporting vocals and blinking bass from Josh Gilbert. "Tempest" is a straight-up rock number that will surprise AS I LAY DYING fans, but it's agreeable nonetheless. The rolling chugs on the verses of "The Mason" is the closest (along with "Profane") WOVENWAR treads into AS I LAY DYING territory, yet the soaring choruses and Shane Blay's cadence keep the song from turning ugly. The gorgeous twin guitars on the bridges give Blay's terrific pipes extra verve, even if he turns in a scream as part of a needless breakdown sequence. Afterwards, "Moving Up" and "Sight of Shore" both ply for an AOR feel, which work well enough if that's WOVENWAR's future prospectus. Set against the preceding tracks, however, "Moving Up" and "Sight of Shore" are couple of cheats, no matter how ship-shape they're delivered. "Father Son" likewise takes a radio-friendly approach, albeit there's a bit more soul injected into the song, particularly when the digital pulse behind the overt whisper of the song gives way to a bursting, organic instrumental climax. "Profane" toughens up with banging riffs, annealed shredding and scattered tempos before projecting loud anthems on the choruses. When Blay hollers after the second chorus, it actually serves a purpose in time to the rising crescendo of "Profane". The song plays to win and succeeds nicely. WOVENWAR follows this energy blast with the equally weighty "Archers", even if the overly cautious "Ruined Lives" thereafter pulls the reins back in, minus some big-time choruses. While the remainder of the album follows the same blueprints of the other tunes, "Prophets" is the best number of the album's second half. It leads off with a lengthy acoustic prelude that would've been likeable on its own, but as the rest of the band picks up the base melody, the song elevates into a booming stadium rocker. The good news to WOVENWAR is they're not out to refabricate AS I LAY DYING. Quite the opposite; it's almost as if they're out to bury the former band, no matter what stake Jordan Mancino (or any of the remainders) has in it. Minus a handful of unnecessary breakdowns, WOVENWAR is a veritable reinvention phase for Mancino, Sgrosso, Hipa and Gilbert. With Shane Blay, it's evident they all aimed to deliver a major league rock record. Blay is an ear-pleasing singer and it's hoped he will usher his new buddies back into a positive spotlight. WOVENWAR may or may not be too poppy for listeners, but when faced with the adversity these guys have suffered, it was either going to be this route or a darker path. Whether you dig it or you don't, they've headed toward the light and there's no looking back.